We know that quality style advice can be hard to find. There so many fashion magazines that give advice that doesn’t really work because it’s far too general and often celebrity-centric. Added to that are fashion blogs written by interested amateurs or sponsored by clothing companies making it difficult to have faith in as the source is either inexpert or has undisclosed motivations. This is why Imogen Lamport, one of the 16 Style Types team, started her blog Inside Out Style in 2008 – to help women of all ages and stages of life to learn what works for them, to cut through the fashion hype and discover intelligent and useful style guidelines. With over 2,000 articles that delve into the science and art of how to express you style on Inside Out Style, it’s a brilliant place to start finding the style and color tips that will help you understand what works for your unique body, and why. One of the most popular style blogs in the world, Inside Out Style will give you a set of practical tools you can apply immediately. What Suits my Body Shape? You can take the free Body Shape Calculator Quiz here and then download your free Body Shape Bible which will give you the inside scoop on what suits your shape. 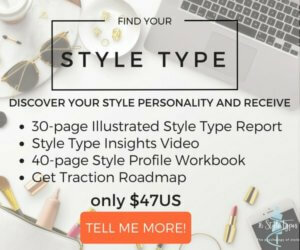 You can choose to invest in 7 Steps to Style, which is the most comprehensive style program you will find anywhere. This program will help you discover the styles of clothes that flatter your body shape, proportions and variations, you’ll also receive a personal color analysis that delves into your personal values, plus content on the way you communicate with your clothing, and what you need to know to build an effective wardrobe for your lifestyle. Already Know What Works For Your Body and Coloring? Then think about joining in a fun 31 day style challenge such as Evolve Your Style that will have you thinking more about your everyday style and how you put your outfits together each day. This is particularly good if you’ve gotten into a bit of a style rut, or are just unsure of what you do and don’t like about the clothes in your wardrobe right now. Shopping Too Much or Got a Wardrobe That’s Bursting at the Seams? If you’ve always loved shopping and have started to realize that this has become a costly business for you mentally and emotionally, one of our other 16 Style Types team, Jill Chivers, has developed programs to assist you in stepping back from the stores and regaining control over your shopping habits with her Shop Your Wardrobe programs.